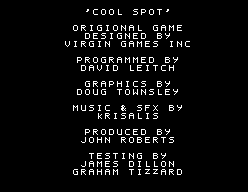 Cool Spot (クールスポット) is a 1993 platform video game developed and published by Virgin Interactive staring the then mascot of 7-up, the 7-up spot. It is a sequel to Spot: The Video Game, a puzzle game similar to Ataxx initially released on the Commodore Amiga and Atari ST. The game was followed by the isometric platformer Spot Goes to Hollywood in 1995. The gameplay, summarized in the introductory picture before you go to the first level, is very simple - the player character's goal is to explore each level collection the red dots scattered throughout. Once the player has collected enough, he'll be able to clear the level by finding a cage with an ally character trapped inside, and breaking it. Besides the spots, levels have typical platformer elements - Items, traps, and enemies. Enemies can usually be defeated by firing the player's fizz-like projectile ( / ) at them until they burst. Said projectile can be directed by the D-pad (including diagonals) and is also used to open the cages. / jumps (holding jumps higher). Bonus levels can be unlocked by collecting an even greater amount of red dots than is necessary for level completion; usually, the amount of dots for a bonus level are close to the amount of total dots on a stage. Bonus levels give the player even more Extra Life opportunities. Not present in the 8-bit versions. Cool Spot was developed with the Sega Mega Drive in mind before being ported to other platforms. As Spot stood as a mascot for 7-up, Cool Spot was originally intended to help promote the 7-up soft drink, however curiously most 7-up branding was removed following its initial North American release. 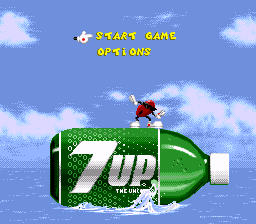 The PAL and subsequent Super NES versions still credit the Seven-Up company for the license to use the Spot character, but all branded bottles are replaced with unlabeled alternatives (such as the bottle Spot rides in the introduction). The PAL Mega Drive versions were were partially optimised to have correct music speed, put the gameplay is slower than in the NTSC version. As a result, forcing the game to run at 60Hz causes the music to play too fast. Most conversions of the game retain the same core gameplay as seen in the Mega Drive version, however in the case of weaker systems such as the Master System and Game Gear, graphics and audio are cut back. The Super NES version, released several months after the Mega Drive original, offers more colourful (and in some cases, more "animated") graphics, but at the expense of screen resolution. In this case, the assets, designed for the Mega Drive's 320x224 display, were not re-worked for the 256x224 resolution of the Super NES, and subsequently appear wider than originally intended (alongside a reduced field of view). However, the Super NES version is able to make use of semi-transparent sprites which not achievable on standard Mega Drive hardware. Note: Michael Merren is only credited as producer in the PAL version. Main article: Cool Spot/Magazine articles. Main article: Cool Spot/Promotional material.